Until the 1980s, Takeshita Street―a back street only minutes from Omotesando(_)―was one of the sleepier parts of Harajuku. 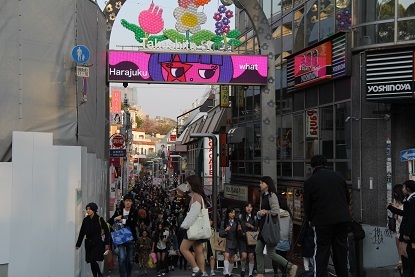 Not so today, as well over 100,000 younger people visit Takeshita Street per day, most of them in search of fashion goods. Over 50% of the street’s 300-plus shops focus on clothing or accessories. The pedestrian-only street and its associated alleyways are almost always having with a slow-moving mass of teenagers. It is a daily festival of youth and a carnival of fashion. If hungry, head elsewhere, as the street has but a few eateries, although it is renowned for crepes and has several such outlets.